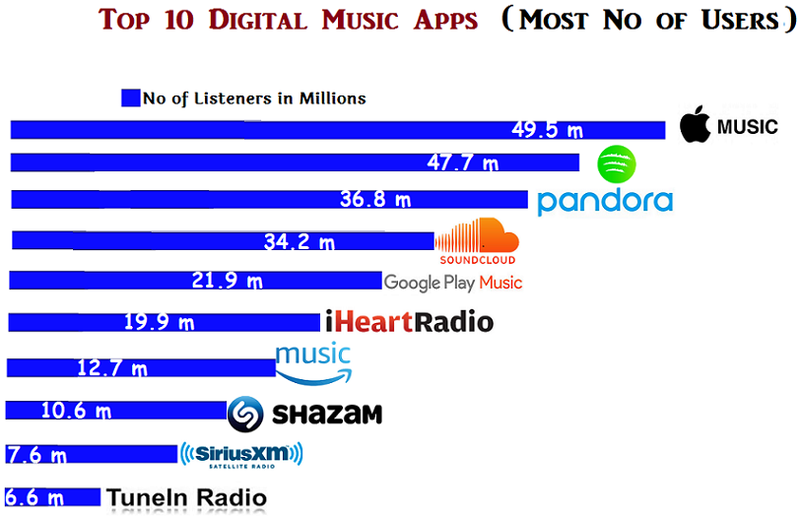 There are more than a million music apps on Play Store and App Store as well. Most of these apps are available free of charge,but many also feature monthly subscription fees and in-app purchases or ads. Given below are some of the best music apps for both iOS and Android platforms, the rankings are based on User Experience and not on the number of Users per streaming service. Please refer to the graph above for rankings purely based on the number of users per streaming service. Google Play Music has a clean design lined with custom radio stations and hand picked playlists. The app grants you full access to your cloud-based music collection anytime, anywhere. If you are not out and about, you can still access the music from the Play Music website. The subscription costs $10 a month giving you access to Google’s massive songs database, YouTube Red, personalized radio stations, smart recommendations and more. With Play Music, you can upload up to 100000 songs to Google’s cloud even with the free app. This is Apple’s first music streaming service. It offers you access to any song in their library no matter where you are. It is available for both the Android and iOS platforms. Subscription starts at $10 monthly for individuals, $5 for the students and $15 for the Family option. You can also upload 100000 songs to Apple’s servers, but there is no free option. This might seem like an odd choice since it only allows you to listen to the music on YouTube with the screen off. Just like the normal YouTube, you will be interrupted by ads when using the free version. To avoid interruptions, you can pay for YouTube Red for $10 a month and enjoy yourself ad-free. One benefit of YouTube Red is if you have the account, you have access to the entire Google Play Music catalog. This is one of the oldest and best-known music players in the game. Spotify has more than 70 million subscribers and more than 30 million tracks. It also has a desktop counterpart which boasts of the same functionality allowing you to stream entire albums and single tracks as well as create custom playlists. A free account can only take you so far but if you want to play and download any song for offline listening and listen ad-free, subscribe for $10 a month. There is also a student subscription that comes with Hulu as well as a family option. Tidal was originally designed for the audio aficionado and boasts of more than 25 million quality tracks; tailor-made suggestions, quick access to music videos and in-depth interviews of famous artists. It’s subscriptions are split into premium $10 a month, standard service $20 for completely lossless tracks. And there are discounts for Family accounts, members of the US military and students. Amazon made a late entry to the game, but it’s app is pretty good. For $$ a month, you get access to the full library in Amazon Music Unlimited. For Amazon Prime subscribers, its just $ and they get access to more than 2 million songs for free. Amazon allows you access to free songs and the entire cloud player library inclusive of the uploaded songs. It is one of the digital music apps that has a massive library of tracks. It has a Flow feature that learns about your favorite music and creates a mix of music and artists for you. Premium subscription starts at $10 per month giving unlimited access to all songs, no ads and offline playback. If you want the free version, there are ads and you are restricted to the Flow feature. Despite having a dwindling user base, Pandora is a mainstay in the streaming realm. It provides personalized online radio and it’s a solid choice for users who want to stream music direct from their mobile devices. Premium costs $10 and the Paid Pandora Plus members enjoy unlimited skips, replays and can download stations for listening offline. Available for both the iOS and Android platforms, this is the longest running online music streaming app. It rebranded from Rhapsody to Napster,but it’s not a file sharing app anymore. Users can stream and download music on the go as well as download playlists and albums for offline listening. With the app, you can stream via Chromecast and Sonos too. Many streaming apps are free for some time then start charging a fee. Jango is different and it is entirely free with no hidden costs. The app has no intrusive ads. Just small ads that appear under the album art and they aren’t intrusive. With Jango, you can also share stations with friends on Facebook and Twitter.